Blog What Are The Swimming Spinal Effects? 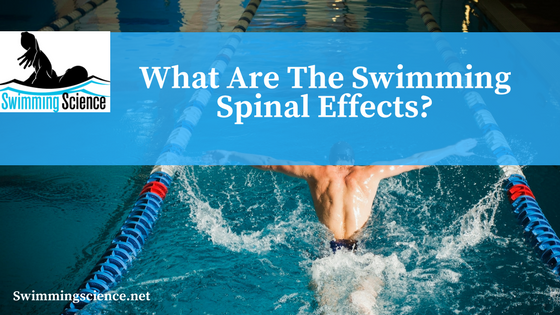 What Are The Swimming Spinal Effects? Exercise fatigue is from a plethora of factors. One emerging factor is inspiratory muscle fatigue. Swimming is one of the only sports requiring intermittent hypoxia, increasing the demand for the respiratory system and increasing fatigue to the inspiratory muscles. Many swimmers also choose swimming due to the minimal spinal loading. Unfortunately, all competitive sports result in excess thoracic kyphosis and lumbar lordosis to transverse mechanical power from the upper to lower body (in ground-based sports). These alterations in spinal curvature increase the likelihood of low back and shoulder pain. eScapular-motion abnormalities result from inadequate serratus anterior activation, excess upper trapezius activation, pectoralis minor tightness, posterior capsule tightness, inadequate rotator cuff activation or partial tearing, pectoralis major tightness, and thoracic kyphosis or flexed posture. Breathing occurs from two sets of muscles, primary and secondary respiratory muscles. The primary muscles include the diaphragm, whereas the secondary muscles include many trunk muscles. The study looked at exercises for the respiratory muscles, which have the advantage that the load can be accurately set by regulating frequency and depth of breathing. Twenty-six healthy swimmers were recruited and randomly placed into a control or exercise group. Then, the spinal curvature was measured in the sagittal plane, pulmonary function was measured vital capacity and forced expiratory volume in 1.0 seconds, and core muscle isometric strength in the sagittal plane. The exercise group performed the respiratory-muscle exercises with a handhold device breathing in and out maximally. This exercise group performed 10 minutes three times a week for four weeks. There was a significant decrease in the thoracic and lumbar angles after the intervention. Muscle strength increased in trunk flexion in the exercise group. The pulmonary function also increased after four weeks in the exercise group. Posture is one factor in musculoskeletal pain. This study suggests that performing four weeks of exercise improves spinal curvature, spinal flexion strength, and pulmonary function. This study shows promise for pulmonary training for injury prevention and potentially swimming performance, but many limitations exist: 1) there was no placebo group or comparison group, 2) the study did not correlate change in curvature on performance or injury, 3) one plane of motion was measured for spinal curvature and core strength, 4) the reason for spinal alignment is speculative because muscle function was not measured.Respiratory training in swimming is a relatively new and potentially rewarding field for training in rehabilitation and sport. Obayashi H, Urabe Y, Yamanaka Y, Okuma R. Effects of respiratory-muscle exercise on spinal curvature. J Sport Rehabil. 2012 Feb;21(1):63-8. Epub 2011 Nov 15. What exercise/s can be recommended to improve as above? A variety of exercises can be performed. Ensuring you’re utilizing an individualized program aimed to help the limitations of the athlete are most effective.